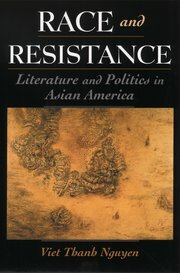 Race and Resistance: Literature and Politics in Asian America is available in hardcover, paperback, and Ebook from Oxford University Press. Beginning with Onoto Watanna in 1896 and ending with Lois-Ann Yamanaka in 1996, Race and Resistance looks at how Asian American literature has played an important role in the politics of Asian Americans. Through their literature, Asian American writers have recorded the struggles for survival, equity, justice, memory, and representation that Asian American populations were so often denied. Not surprisingly, Asian American literary critics have tended to use Asian American literature as a lens through which to examine Asian American politics, both in terms of what Asian Americans experienced and what those experiences have to say about American culture, history, and politics. Race and Resistance argues that while this method of reading has been powerful, it has also encouraged an approach to literature that looks for signs of resistance to oppression. Writers that are seen by critics as engaging in resistance are foregrounded, and writers that are seen as accommodating to power have been overlooked. In this way, Asian American critics have shaped the canon of Asian American literature around a consensual set of political values. Given that Asian American literary criticism has been one of the most influential sites where thinking and theorizing about Asian American culture and politics has taken place, this model of reading has influenced Asian American cultural politics in general. The academics of Asian American studies as a whole, as well as Asian American intellectuals working in other fields like activism and journalism, have likewise thought of Asian American culture as being defined through acts of resistance and progressive politics. While enormously enabling in terms of cultural work and political organizing, this model also has significant limited the ability of Asian American intellectuals to deal with wide swaths of Asian American life that are not so politically inclined.